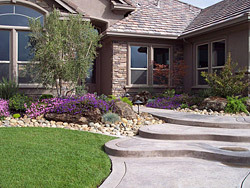 Landscape masonry is one of the best methods to enhance an outdoor area. The flexibility in designs and the desired effects offered by hard stones and concrete can very well complete any kind of landscape aesthetically. This is without mentioning yet that a well-planned masonry project can add functionality, distinction, and value to any property. A well-designed patio as part of the landscape design can very well enhance the aesthetic and resale value of your property. Plus, a patio can work as an extended living space outdoors that can be used for relaxation purposes as well as entertaining guests. Patios can be made from concrete, brick, slate, or rock. Basically, retaining walls are meant to add texture to a landscape. Walls can be used to stabilize slopes, protect areas from erosion, create outdoor rooms, group plants, and a lot of other purposes. 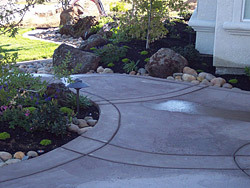 A well-planned and constructed path in the landscape can create interest in the outdoor space. It brings convenience to you and the guests. The most popular walkways today are made from concrete. Ponds, waterfalls, and fountains are also works of landscape masonry. These elements in the landscape add a focal point as well as bring in a sense of serenity to the space. If you want to increase the functionality of your outdoor space, adding fireplaces or fire pits is a good idea. This adds both beauty and warmth. And, these elements can extend your outdoor life into the winter season. Indeed, there are a lot of great things landscape masonry projects can bring to your outdoor space. And given the materials used for masonry projects, you can be certain that they will all offer long lasting beauty that requires less maintenance most of the time. Plus, masonry materials are all fire and weather resistant and also promote energy efficiency. Landscape masonry projects are very much complicated that only professionals can be trusted to handle them. From the designing to the installation process, only professionals must be allowed to touch these projects to ensure success. And since masonry projects can turn out to be a big investment, you do not want failure along the way. If you need any masonry works for your landscape, Design West Landscaping is just a call away. We are a licensed landscape contractor so expect that we can deliver great results. We are a group of skilled people who have years of experience, creativity, and skills that can guarantee the best masonry projects for you. We currently cater several areas in California including Brentwood, Clements, Danville, Dublin, Elk Grove, Jackson, Stockton, Woodbridge, and Sacramento. If you need more information about our masonry services, just fill up the inquiry form and we will respond to your queries the soonest possible time.